Focaccia buns fit right into the theme of summer buns with the #Twelve Loaves baking group. From breakfast to supper to meals in between, summer buns describe a variety of breads. Rolls such as hamburger buns and hoagie rolls seem to be at every picnic as the summer months go by. 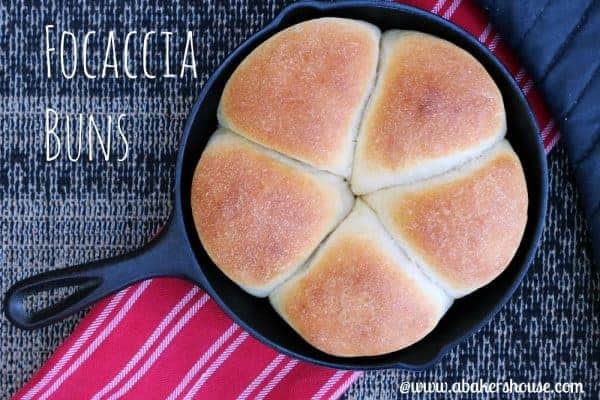 I chose to make a variation on a picnic roll in these focaccia rolls. Focaccia is an easy homemade bread recipe to make at home. I shared this basic focaccia recipe last month and a cherry tomato focaccia last summer. An herb focaccia roll sounds warm and flavorful too for a focaccia burger bun. You could also top these with sesame seeds or poppy seeds. Today’s recipe combines aspects I liked of each of those previous doughs and comes together in this summer bun. Do you say bun or roll? 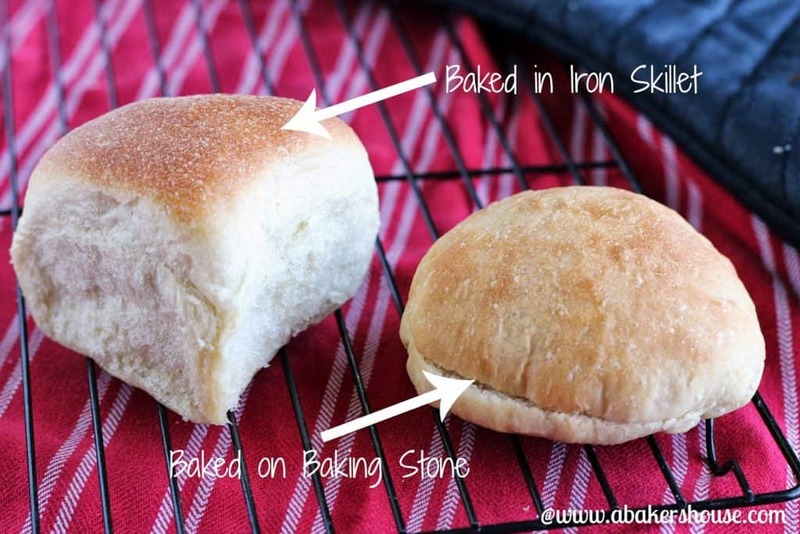 By the way, I think it depends on where you live whether you call this particular bread a “roll” or a “bun”. Who out there says “hamburger roll” and who says “hamburger bun”? I am torn in between the two. I grew up calling them hamburger rolls on the East Coast of the US but now (in Colorado) I think I lean towards saying hamburger buns more often. I am still experimenting with breadmaking techniques and have a lot to learn. One way to get more familiar with how dough behaves is to treat it like a science experiment– change one specific characteristic or step in your process then learn from the results. Today I focused on shaping the dough. 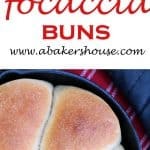 I wanted to figure out how to make pretty little focaccia buns like these which I found in the June issue of Cooking Light. The focaccia rolls were part of a grilled chicken sandwich and were listed in the ingredient list as rolls– just another item to buy at the bakery. Cooking Light’s focaccia rolls were golden brown, round and ready for a bite. The perfect sandwich roll. I had trouble getting my rolls to keep that perfect shape when I simply let the rounds of dough bake on a baking stone. It may be that I handled the dough too much after the second rise as I transferred the risen dough balls to the stone. The result was a flat bun– not bad to eat, just not what I had envisioned. Second try for focaccia buns (same dough, same rising times) included a cast iron skillet. I like the way focaccia bread rolls have baked in the skillet in previous attempts and thought that eliminating the action of touching the dough to move it to the baking surface would be a plus. The dough rises and bakes in the same skillet. Did this work? Yes, I think so. The buns did not have the round-like-a-ball shape that I noticed in the magazine but they were golden on top and soft in the middle. By the way, if you bake or cook often with cast iron, read these tips on how to keep your cast iron clean and working for years! I will continue to work on this dough and on shaping breads. It’s amazing to see how changing one step can produce such different results. Good news is that I would eat and enjoy either one of these focaccia buns! Serving buns as a side to a meal of chili, hearty soup, or a fish dinner would be a welcome addition to your meal. Mix all ingredients in a stand mixer with the dough hook on low until dough comes together in a ball. Then continue to use dough hook on medium low speed to knead the dough for 3-5 minutes. Dough will be slightly tacky. Spray a glass bowl with baking spray. Turn dough ball a few times in the bowl to coat it with the spray then cover the bowl with plastic wrap that has been sprayed with the baking spray. Let rise for an hour or until doubled in size. After the first rise, separate the dough into balls. My dough made 9 dough balls each about 3.8-4.0ounces in weight. These are large-- 18 rolls would be fine too. Coat the dough balls in olive oil using the 1/4 oil listed in the ingredients then set either on a baking pan or arrange in an iron skillet. Cover and let rise again for an hour. Lightly brush again with olive oil. Bake at 450 degrees F for 15-18 minutes. You can bake these on a bread stone or in a cast iron skillet. Pin this focaccia roll recipe here! 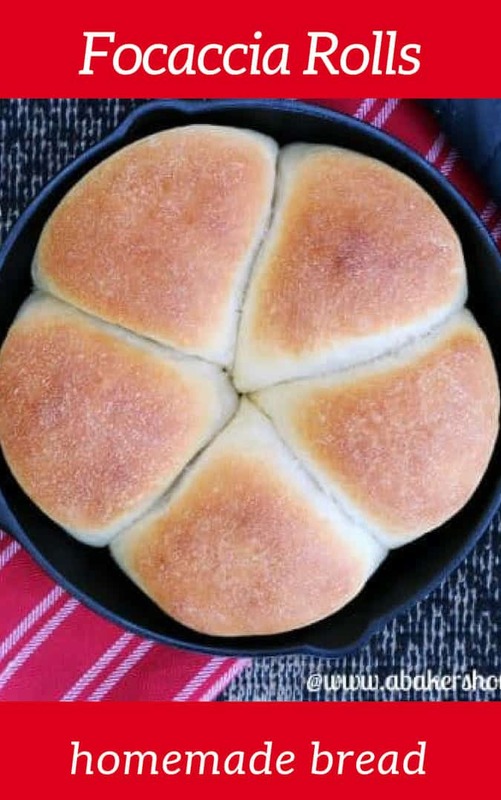 Holly, I LOVE both your techniques…the rounds would be perfect for sandwiches, but the ones baked in a skillet would be outstanding dinner rolls (and what a gorgeous presentation!). Well done. Thanks, Liz, I am enjoying baking bread each month and learning each time and with every recipe. I’m headed over to your site now, your title has my mouth watering! 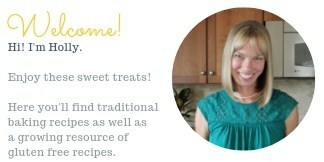 Hi Lora, It’s my pleasure to bake along with your group, thanks for having me! Looking forward to reading about all of these lovely summer rolls today. Great theme this month! It is hamburger BUNS here in North Georgia. I really like the way the one you cooked in the iron skillet looks, so light and airy. Thanks for commenting, Charlotte, and letting me know about the bun/roll topic of debate in Georgia! Hope you enjoy some summer barbeque this year! Gorgeous photos Holly! I cook everything I can in my iron skillet. In my opinion, everything tastes better when it is cooked in one. Thanks, Karen, I need to remember that I have this iron skillet more often. I think if I left it out on the stovetop for a week that I’d find lots of reasons to use it. Holly, I never thought about it, but it’s hamburger and hot dog buns here in California, but dinner rolls. One that could go either way is cinnamon buns/rolls. Ha ha. Your skillet focaccia is gorgeous. Love the photos too! You are right, Karen, I can’t seem to remember saying dinner “buns” on either coast or here in the middle. Thanks for sharing your experiment with us! I would have to make two batches. One to eat the first night and one for sandwiches using leftovers the next day. 🙂 Absolutely beautiful photographs as well. I can just imagine these on my table. I’m going to give these a try. Hi Dionne, I can’t shake the love of science out of me and with baking it fits right together. I suppose I call a lot of my baking mistakes “experiments” but this was one I enjoyed! I live on the east coast in Florida (I’ve lived in Florida all my life) and I’ve always called them hamburger buns. Is it hot and sticky in Florida yet? Hope you are easing into summer there. I am sure you’d make a beautiful focaccia. All of your breads turn out well! Wow!! I love this baking project and the way you handle it like an experiment! I have to buy a smaller iron skillet and this might be the first thing I bake after I season it! Cast iron skillets make the difference in so many things. I’m going to try my next batch of rolls or buns in mine. They may not be round but I’m loving how it made such a difference in the rise and texture. Oh, and focaccia buns = brilliant!! Hi Renee, I agree, the rolls I made weren’t round but I didn’t let it bother me. I bet if I added a roll to the middle of the pan that the shape of the buns would have been more consistent. What a great group of posts this month! Focaccia for me has a special magic. I’ve never tried it in buns or cooked in cast iron skillet. Your focaccia buns look really great. Yes I like focaccia of all sorts too. Thanks for reading! Isn’t focaccia an easy dough to pull together in a few hours? I think I’ll make these buns often this summer. Perfect for bbq and picnics too. These look miles better than the ones I buy at the grocery store. I can’t believe what a difference the baking vessel makes! Thanks, Kiersten, I think I am going to bake a lot more often in my skillet. It produced such a nice crust on these buns and let the heat distribute evenly among all of the buns. Buns, rolls, buns, rolls– I go back and forth all of the time between the two terms. Either way these focaccia rolls worked out nicely and I’ll turn to this recipe again soon for sure. Thanks for writing, Wendy! I think I’ll keep up experimenting with dough– it only took a small bit of extra effort and time to bake these in two ways and I learned a lot. It’s fun baking along with the group as always! 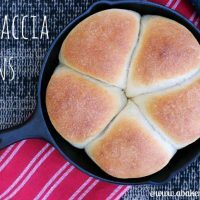 I love focaccia and these buns look great! Thank you for sharing this recipe!! I made these last night and they are soooo tasty. I don’t have a cast iron skillet or a pizza stone so I just put them in a round glass baking dish, and they turned out looking just like your skillet photo – big and fluffy. This recipe is a keeper! SO HAPPY to hear that you enjoyed this recipe!